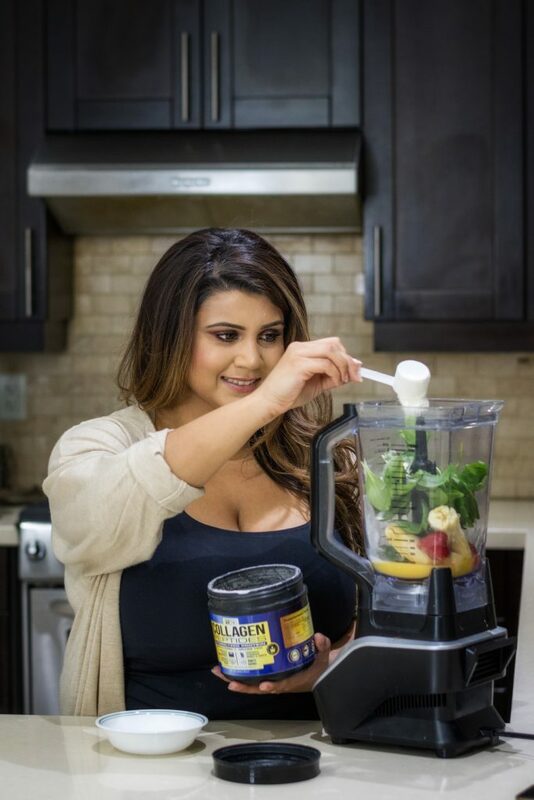 The following post is brought to you by Dr. K’s Collagen Peptides Powder — bovine collagen full of clean and natural ingredients that are both safe and effective. To learn more about collagen, visit their website, place an order on Amazon using discount code ‘15A6Hh1J’ for 15 percent off, and follow @doctorkwellness on Instagram and Facebook. As I’ve gotten older, my priorities towards my skincare and living a healthy, balanced life have also shifted. Taking care of my skin not for maintenance, but also for preventative measures is of utmost importance. Now preventative measures aren’t only to avoid wrinkles and spend countless amount of dollars on topical products. A huge portion of that also comes from taking care of your insides because what you put into your system will show on your face and skin. Thus, I’m a big believer of taking care of myself from the inside out. Your beauty regime is going to do you no good if your skin or internal health is not up to par. So for that reason, I focus a lot of my time researching and learning about the right products to not only use topically but how does my eating and help with my overall skin and make it looking good for years to come. Now, this is a prime example of killing multiple birds with one stone. I was apprehensive of what taking collagen because I was afraid if it would alter the taste of the products I was taking it with. But to my surprise, Dr. K’s collagen powder doesn’t alter the taste at all! I can enjoy the foods I want, for example, smoothies, hot beverages or baked goods. I started using the product in my smoothies. I would add everything I want in my smoothie plus a scoop of collagen, and the taste would be exactly how I like it without the added taste of supplement. I do a lot of Paleo baking, so to have this supplement in my baking and to enjoy it, even more, is absolutely like a dream come true for everyone with a sweet tooth. Not to mention, I throw Dr. K Collagen in my iced coffee and morning chai as well. Since using the collagen religiously for a few months now, I have that healthy inner glow we always crave. My hair used to also fall out a lot but I’ve also noticed a significant drop hair loss, especially while brushing my hair when it’s wet. The benefits for me didn’t stop there because I have gut health issues, gastroesophageal reflux disease (GERD), in particular, and with the Collagen Peptides, my system has been doing a lot better. The symptoms have subsided and I have more of a lighter feeling in my stomach. Couldn’t have been happier to have included the Dr. K Wellness Collagen Peptides in my daily routine. It doesn’t feel like a chore to get my supplements with all the fun ways of taking it in! To learn more about collagen and science-based nutrition to live a more wholesome life, visit their website, place an order on Amazon using discount code ‘15A6Hh1J’ for 15 percent off, and follow @doctorkwellness on Instagram and Facebook. *All content above is created and published online for informational purposes only. It is not intended to be a substitute for professional medical advice and should not be relied on as health or personal advice. Always seek the guidance of your doctor or other qualified health professional with any questions you may have regarding your health or a medical condition.